Description: Silas Murphy (aka the Pumpkin Whisperer) has the enchanted ability to trap lost souls of the Living within inanimate objects such as scarecrows and pumpkins. Silas raised his personal army of Sinister Scarecrows to combat the Wicked Werewolves responsible for his wife’s death. 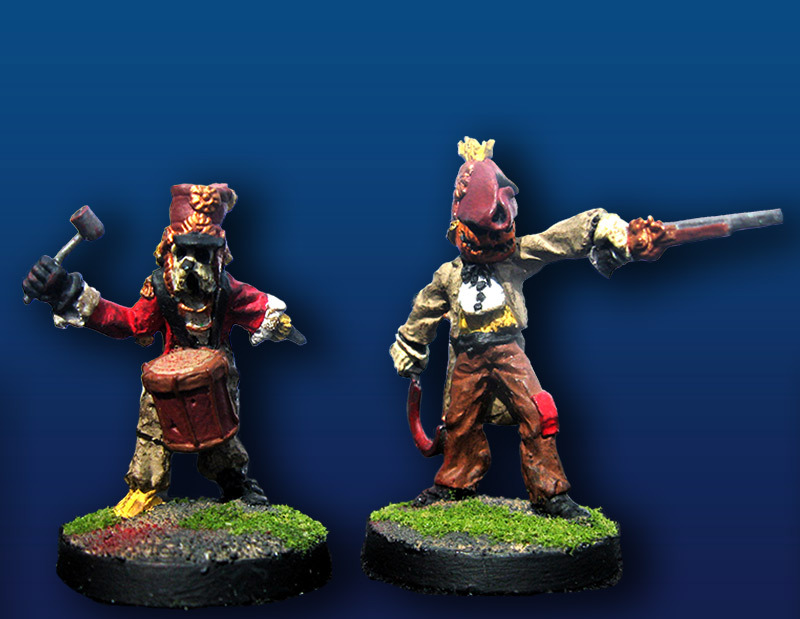 While not the most powerful army in weaponry or Size, the Sinister Scarecrows are large in numbers and are skilled in close quarters, plus they are a truly horrifying sight to see on the battlefield. Halfmoon was a Special Mission Force Zombie Hunter before dying in a 3-way battle with the Sinister Scarecrows and AnCon Annie’s Serum Z Zombies. Silas the Pumpkin Whisperer used the opportunity to trap Halfmoon’s soul into serving his army against the forces of Undead. Halfmoon is often found fighting alongside Squash the Pumpkin Muncher against Zombies. Taps was a drummer in his high school marching band before a careless act led to an early death behind the wheel of his parents’ new car. Silas, who lived near the crash site, took pity on the lost soul, and using his talisman, cast the spirit into a hastily fashioned scarecrow host. Taps is armed for battle with the mysterious Enchanted Drum of Evocation.